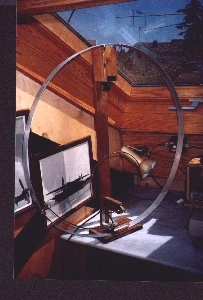 This magnetic loop is 78cm diameter, with the smaller Hertz loop for tuning. Feeding is by gamma match. The capacitor is on a small wooden box that originally held a sample of British wine! The capacitor itself, about 120pf was from a military transmitter and is rated at 1kv. The loop is of aluminium, bent round a wine barrel (wine seems to help Rogerio in his projects!). Works well indoors with 5w CW and 10w SSB (helped by good propogation!) and features in CT1ETT's secondary attic shack.